Intrepid conservation staff poke into the earth’s dark nooks and crannies in search of salamanders, frogs, turtles and other rare creatures. Welcome to the making of Ontario Nature’s Reptile and Amphibian Atlas. John Urquhart is rolling back old logs in this midsummer forest the way a kid in a just-discovered corridor opens door after hallway door. He’s moving from one fallen tree trunk to the next, up a bright wooded slope at Lost Bay Nature Reserve north of Gananoque. He lifts each log gingerly and peers beneath it as if into a dark passage – past a threshold to some secret world. “There,” he says, as a tiny black shape suddenly skitters from the shadows. It looks at first like a fast escaping beetle, but Urquhart deftly scoops it up and reveals an impossibly small, fully formed salamander, its glistening eyes no bigger than specks. Urquhart pauses with the motionless eastern redback salamander in his palm. It could be a miniature glazed replica of a slender black lizard. The red on its back is barely discernible. Urquhart blinks with boyish wonder at the creature’s proportions; an animal this tiny is a rare find even for a regular visitor to the cryptic places a rolled log reveals. Urquhart is Ontario Nature’s staff ecologist with the Ontario Reptile and Amphibian Atlas project, an ambitious effort to map the whereabouts of some of the province’s most secretive and enigmatic creatures. Like the Ontario Breeding Bird Atlas project before it, the Ontario Reptile and Amphibian Atlas is gathering observations submitted by hundreds of volunteer naturalists who scour large areas that comprise squares of a grid superimposed on a map of the province. The volunteers then report the species of salamanders, frogs, toads, snakes, turtles and lizards they find there. 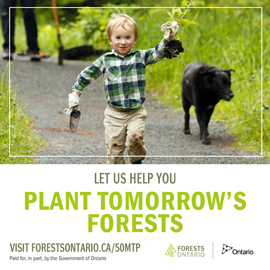 Started in 2009, the project – spearheaded by Ontario Nature in cooperation with the Eastern Ontario Model Forest, the Ministry of Natural Resources (MNR) and other partners – will also bring together existing amphibian and reptile records from museums and volunteer projects such as the Ontario Turtle Tally, FrogWatch Ontario and the Marsh Monitoring Program. The new atlas is not only providing important information for conservation biologists and others, it is also raising awareness. While Ontario’s beleaguered snakes and turtles have received a lot of attention recently – 18 of 32 reptiles that have been found here are now considered species or subspecies at risk – many amphibians in the province are also in trouble. The atlas is an overdue opportunity to shift some of the conservation spotlight to these lesser-known and more enigmatic creatures. Urquhart and his long-time friend and colleague Joe Crowley, the atlas coordinator, are charged with the massive task of orchestrating the enterprise and rallying legions of citizen scientists to help. Of course, when an area of the province needs special attention or when volunteers are not covering an important grid square, the biologist duo takes to the field – “just get dirty,” says Crowley. This morning, for instance, Crowley is up to his chest in marsh muck, checking nearby turtle traps, while Urquhart shows me around other areas of Lost Bay, Ontario Nature’s recently expanded 101-hectare nature reserve on Gananoque Lake in eastern Ontario. The reserve – and a supportive neighbour’s log cabin – has been a kind of summer home base for Urquhart, who divides his time between atlas work and surveying the property for rare turtles and snakes as part of Ontario Nature’s Reptiles at Risk project. leopard frogs leaps in deep grass. After several attempts, Urquhart nabs what he calls an “in-betweener.” It is a pickerel frog, a less-than-common animal usually distinguished from its near-twin species, the leopard frog, by the shape and arrangement of its spots. Usually. The spots on our captive are ambiguous; it doesn’t fit the typical field guide description. Urquhart has to look for other clues to make the identification. “These animals don’t read the books,” he remarks dryly. In truth, few people read the books either: amphibians simply don’t get much attention. As a group, they are among our least familiar and most poorly understood animals, apart from insects. Other than during the spring chorus, when common frogs and toads are at least audible, Ontario amphibians are extremely successful at remaining inconspicuous. 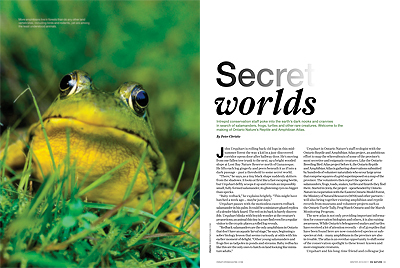 Even for many naturalists, amphibians are a kind of natural-history blind spot. The irony is that greater numbers of amphibians live in our forests than do any other land vertebrates, including birds and rodents. More significantly, few other animals are as vital to local ecosystems – as food for other creatures and for moving nutrients into the forest from pools and ponds as they metamorphose from water to land dwellers. Meanwhile, their dual citizenship in both aquatic and terrestrial domains makes amphibians especially qualified as harbingers of environmental change. Yet these days the cog is showing signs of stress: frogs, toads and salamanders comprise the most at-risk class of animals on the planet. Scientists say a third of the world’s nearly 6,000 known amphibian species are threatened with extinction (compared with 12 percent of all birds and 23 percent of mammals). Nine species are believed to have disappeared since 1980, and another 113 have not been seen in years (see sidebar above). In the tropics, the rate of vanishing amphibian species is threatening to rival some of the great mass extinctions of history. In 2010, news that 41 percent of the planet’s nearly 6,000 known amphibian species were at risk of extinction rocked the conservation world. Moreover results from a worldwide study called the “Global Amphibian Assessment,” were published in the journal Science and found that nine amphibian species had been wiped out since 1980, and another 113 – not seen in years – may have disappeared for good as well. Also troubling were the reported declines among common frogs, toads and salamanders. The population numbers of just under half of all amphibian species in the world had dropped, according to the study. Most researchers believe that dramatic declines in many tropical frogs and salamanders are linked to an outbreak of a fungal disease that affects the skin of adult amphibians. (Much of an amphibian’s immune system resides in their skin.) The disease, caused by what’s known as chytrid fungus, appears to spread rapidly, killing frogs by the millions and wiping out populations and even species with disturbing alacrity. What this means for Ontario’s amphibians is not clear. Chytrid fungus lives everywhere, including among frogs and salamanders here, says Green. But the disease does not appear to have caused the massive deaths in this country that occurred among tropical species (although some scientists believe the fungus may be the cause of sudden population crashes of leopard frogs reported during the 1970s in Manitoba and, later, in British Columbia). The news for Ontario’s frogs and salamanders is not as grim. Even so, many of the 27 species and subspecies that have been found in the province – 13 salamanders and 14 frogs and toads – are showing signs of trouble. Eight of them, for instance, are designated threatened, endangered or even extirpated on the Species at Risk in Ontario (SARO) list. Seven are also listed on the national species-at-risk list. Three species – eastern tiger salamander, northern spring salamander and Blanchard’s cricket frog – were last reported so long ago that most people consider them gone from the province for good. Meanwhile, populations of formerly common western chorus frogs in eastern Ontario and Quebec have been falling fast in recent years. “For many of these things, we simply don’t know the reasons,” says Green. “Usually, there are a lot of possible ones.” For example, a deadly outbreak of an amphibian skin fungus is now widely blamed for the massive amphibian die-offs in tropical regions. Closer to home, airborne pollution or toxic runoff can sometimes help explain local crashes of frog and salamander populations. A decade ago, a worrying dip in Ontario bullfrog numbers was linked to a sudden craze among urban gastronomes and restaurateurs for frog legs. Because changes in frog and salamander numbers are really telling us something about how our actions affect the environment, watching these trends is critical, according to Green. That’s why, as much as tracking imperilled species is important for maintaining biodiversity, watching populations of more common animals (such as the suddenly faltering chorus frogs) can sometimes reveal larger-scale ecological trouble. Yet there’s the rub, says Green: recognizing the warnings from these creature Cassandras is impossible as long as most amphibians remain poorly studied and distant from our consciousness. If we watch only the frogs and salamanders that are already officially considered species at risk, how will we know when others in this enigmatic group are also in crisis? Eight of the 27 amphibian species and subspecies that live – or have been reported at some point – in Ontario are included on the province’s Species at Risk (SARO) list. But the secretive habits and occasionally sparse distribution of many of these creatures means that their true status is sometimes less than clear, says Ross MacCulloch, assistant curator of herpetology at the Royal Ontario Museum and author of The ROM Field Guide to Amphibians and Reptiles of Ontario. A few amphibians are so uncommon that encountering them at all is a game of chance. For instance, the northern dusky salamander, considered endangered in Ontario, occurs solely in the Niagara River Gorge and remained completely unknown in the province until less than 30 years ago. Fowler’s toads, designated as threatened on the SARO list, are found on just a few sandy sites on the north shore of Lake Erie, and there are just a couple of records of Cope’s gray treefrog having been spotted on Rainy River in northwestern Ontario. The provincial population of endangered small-mouthed salamanders lives solely in patchy woods on Pelee Island. Three amphibian species – eastern tiger salamander, northern spring salamander and Blanchard’s cricket frog – have not been seen in the province for decades. The first two have been designated on the SARO list as extirpated, but Blanchard’s cricket frog still retains its endangered listing. The Jefferson salamander is considered a threatened species on the SARO list and has been found at only about 30 sites in southern Ontario. Other species that are not frequently encountered but are not on the SARO list include the four-toed salamander, seen near southern bogs and swamps, and the central newt of northwestern Ontario. The pickerel frog, meanwhile, is uncommon, but its resemblance to the northern leopard frog means it is probably often overlooked. “Locally, some amphibians are having problems,” says MacCulloch, largely blaming habitat loss or degradation. He notes, however, that because the creatures lay a lot of eggs, their numbers can bounce back quickly if the conditions are right. This year, for instance, was wet and good for frogs. “You can get a lot of year-to-year cycling,” he says. That’s where the Reptile and Amphibian Atlas comes in. The project is gathering data on all Ontario species, everywhere in the province, describing in detail how widespread these animals are and providing an invaluable glimpse of how well or poorly they are doing here. Importantly, it is also picking up where an earlier reptile and amphibian atlas project left off. Oldham, who is a member of the new Reptile and Amphibian Atlas steering committee of experts, began the original Ontario Herpetofaunal Summary Atlas back in 1984. (Amphibians and reptiles are often collectively called herpetofauna, or sometimes just “herps.”) The project – run on a shoestring budget until about 1994 – collected more than 100,000 records submitted by mainly amateur naturalists. One volunteer even turned up a species unknown in the province – the endangered northern dusky salamander – while surveying for the atlas in the Niagara River Gorge. The project gathered another 30,000 pre-1984 reports from museum collections, scientific literature and old field notes from diligent herpetologists. It was comprehensive and the first herpetological survey of its kind for the province. Oldham took the atlas to the NHIC when he joined the centre in the 1990s, but the project became more or less dormant after that (although some records still trickled in). The NHIC continued to formally “track” some reptiles and amphibians, but only species at risk and others considered rare (occurring in fewer than 100 locations in the province). 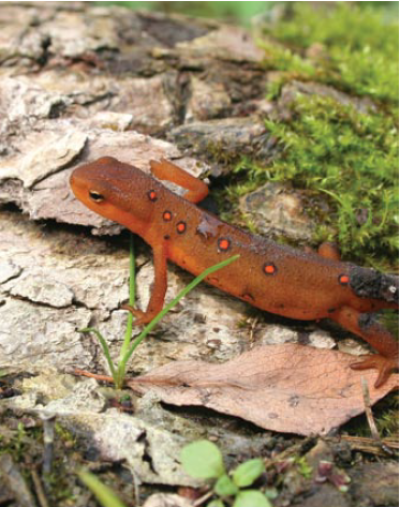 For the most part, our understanding of the whereabouts and population health of the rest of Ontario’s herps drifted once again into relative obscurity – that is, until the new atlas initiative was launched in 2009. This project is expected to release a comprehensive publication after 2014. “If you’ve seen a turtle or a snake or a frog, that’s most of your work right there,” says Joe Crowley. As coordinator of Ontario Nature’s new Reptile and Amphibian Atlas, Crowley has devoted a lot of energy to developing easy ways for the hundreds of project volunteers to submit their observations of frogs, salamanders, snakes, turtles and lizards. Spotting a reptile or an amphibian – or evidence of one – is the hard part; submitting and documenting an observation is simple, thanks to online data sheets and other Internet shortcuts. After encountering an animal – common or rare species, alive or dead on a road – participants should go first to the atlas website (www.ontarionature.org/atlas). There, they will find reporting instructions and an online form for sending records via the Internet, along with a printable version for hard-copy submissions. 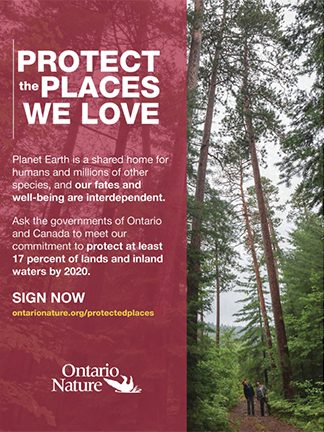 Records can also be e-mailed to joec@ontarionature.org or phoned in to 416-444-8419, ext. 243. Researchers need the species name and some verification of its identity, such as a digital photo or a detailed description. Location data and the date are also important. Any description of the weather, the animal’s behaviour, the number of volunteers involved or how the animal was found is also helpful, but optional. More about how to participate in the atlas can be found on the website, along with references to other resources. Crowley and fellow ecologist John Urquhart also run presentations and training workshops across the province. The online version of the atlas is updated every year. A final published version will follow after 2014. “We like to remind people that there are some rules as well,” says Crowley. Volunteers should leave the animals they encounter alone as much as possible. (For example, capturing or harassing species at risk or destroying their habitat is illegal.) Atlassers should stay tight-lipped about the location of rare species or other information that might be used by pet-trade poachers. Finally, everyone is urged to get permission before searching for reptiles and amphibians on private property. Back at cabin headquarters near Lost Bay, Urquhart sits back in an old kitchen chair and explains other ways in which times have changed since the first atlas surveys. The lanky biologist was barely four years old – a year away from his first pet turtle, he says – when Oldham began the original project. Now, thanks to an easy-to-use atlas website and online data sheets, submitting and compiling records is far faster and easier than in Oldham’s days, when summer students input thousands of handwritten sheets. The ubiquity of digital cameras (almost every cell phone has one) now makes getting and submitting photographic confirmation of an observation almost effortless. What’s more, the Internet-accessible descriptions and up-to-date distribution maps – the online atlas will be updated yearly – mean volunteers can find out right away if a sighting is unusual or outside of a species’ known range. Getting the word out is not simply a virtual exercise. In the project’s first year, Urquhart and Crowley also organized 45 outreach events for local naturalist clubs, conservation authorities and parks across the province – including about 20 workshops, during which hikes in the field offered participants a taste of what atlas work would be like. These recruiting efforts take time, Urquhart says, but the payout for the atlas is huge: in the first season alone, volunteers and conservation groups submitted more than 11,000 records. Peter Christie is a Kingston-based science writer who turned a few stones for the first Ontario Herpetofaunal Atlas. He is the author most recently of Animal Snoops: The Wondrous World of Wildlife Spies. Hi, I was given a magazine with the article about the Karner blue butterfly by Peter Christie disappearing. It caught my eye because I had just taken some photographs of what I believe is this butterfly in Guelph, Ontario. I am NOT computer savy and when I’ve tried to report reptiles and other critters I take pictures of, I get quite frustrated that I can’t get where I want to following websites, to report or send my photos to whomever they may be helpful to. I’m writing here now because of this butterfly disappearing and the chance I saw Peter’s article. I wanted to tell him. Thanks Susan. Please e-mail your photo of the Karner blue butterfly to me at johnh@ontarionature.org. I can talk with one of our staff ecologists to confirm the ID and report the photo. For help submitting photos of reptiles and amphibians please contact johnu@ontarionature.org and he can help you make your submission to our Ontario Reptile and Amphibian Atlas project or visit our website: http://www.ontarionature.org/atlas.